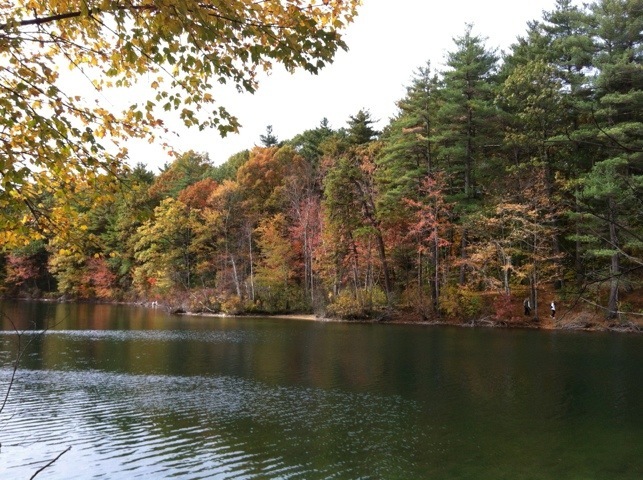 Walden Pond: where crowds come to get away from it all. Scientific impossibility though it may be (apart from for the occasional stray neutrino), time travel has always been a dream of mine. Not so much to see the future, which happens so fast these days that all we have to do is live through it, as to explore the past. Well, my journey from west to east across the U.S. is probably as close as I’m ever going to get to travelling back in time. I started off in Los Angeles, which was the cultural heart of the world for much of the 20th century and still bears the traces of its 80s heyday, before that hegemony started to splinter. Further north still, I spent time in the palace of one of the barons of early Hollywood, W.R. Hearst, who partied with Flynn and Chaplin and was the thinly disguised subject of Orson Welles’ Citizen Kane. I dropped in on Steinbeck’s Cannery Row on the way to San Francisco, which still has the antique feel of the late 19th century around various districts, perhaps a reminder of the days when people from all nations travelled there in search of gold and opportunity. Across the mountains to the east lay two pioneer cities, born from rather different origins: Salt Lake City, built around a core of Mormon settlers escaping persecution/the rule of law (take your pick), and Denver, another gold rush city, proud of its status as the “Mile High City” and its cowboy heritage. I skipped through Chicago and landed in Washington, D.C., smoothing my path through time a bit. Born in the aftermath of the American Revolution, Washington has the look of a designed city: glance down any of those long boulevards and the chances are that you’ll see some imposing edifice framed at the end of it. Celebrating American Independence, it sets aside a large part of its heart to memorialising the figures who played notable parts in the nation’s history. Another skip through New York landed me in Boston, keeping that retrograde progress smooth. From this point, I was in the land where the nation was born: the original thirteen colonies that became states in the War of Independence. Washington may enshrine that memory, but these are the places where the action happened. One side trip brought me face to face with another person who sought to retreat to a simpler time. Henry David Thoreau, whose book Walden recounts his efforts to live simply and at peace with nature by the pond of that name. His legacy attracts plenty of crowds to Walden now, but it’s not hard to walk the path along the water’s edge and suddenly find yourself alone for a moment or two, with just the trees and the water for company. Of course, you can’t live in the past forever. I’m on my way to New York now, and even if it’s a long-settled city, once the Dutch port of New Amsterdam, there’s probably no more modern place in the U.S. Washington may be the nation’s capital, but it’s New York that the world thinks of as the exemplar of the American city, or perhaps even the nation as a whole. A fitting place to wrap up this trip, perhaps. Haven’t been in California since the late 90s but even then I had the impression that it was in decline. My Dad tells me that in the 1960s when he was living in New York, a lot of his friends were talking about moving to the West Coast, such was the excitement about the opportunities there. And yet now it seems so different. Ciaran, though: fantastic post! And thanks for the photo of Walden. Neat to *see* it in more than just words.